The marketing geniuses at Blumhouse are back at it again! 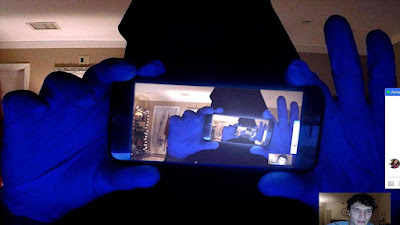 Being that the first Unfriended film was made for $1 million and managed to gross more than $64 million in the theaters (thanks to a new and inventive filmmaking style, showing the entire film from as if we were just looking at a laptop’s screen, spinning off from “found footage”), it’s a no-brainer that they would keep the trend going and release a sequel to the 2014 film. Unfriended: Dark Web, decides not to continue from the previous film, as it dumps the supernatural angle and instead goes in a semi-real-world realm, the realm of the mysterious “Dark Web.” For those without an IT degree (or those who don’t have a Tor browser), the dark web is a part of the known Internet that is not indexable by search engines, which allows those who use it to do more than vent about politics, go on World Star, and whatever else we waste more than half of our lives doing from our phones/computers. Instead, the Dark Web (which most people really don’t know about) allows for some pretty seedier stuff to go on. Don’t worry, the film does it’s best to educate you through one of the characters giving all the necessary computer exposition needed to catch you up to speed. Still using the laptop-based filmmaking style but ditching the teenagers from the first film, Unfriended: Dark Web centers on a group of twenty-somethings, who are all college friends, and they participate in their ritual “Game Night” online via Skype amongst each other. The Main character Matias (Colin Woodell) has just snagged a new laptop from a nearby café, which leads them to all sorts of difficulties on that unfortunate night. After managing to get into the password-protected Mac computer (we’ll get to that in a second), all seems well and the group of friends can carry out their evening of playing virtual Cards Against Humanity. Things start going awry when the owner of the laptop wants his merchandise back and will go to extreme lengths to collect. The film starts off with the logging in on the newfound computer by Matias, complete with him trying endlessly to guess the user’s password with some very funny guessing until he finally guesses the password correctly after more than 14 times (don't Macs lockout after so many tries?) and sets up the groups game night. We get introduced to Matias as we learn that he stole the computer as he needed a machine with processing power so he can develop an ASL app to better communicate with his deaf girlfriend Amaya (Stephanie Nogueras). Then we get to meet his group of college friends: newly engaged couple Nari (Get Out’s Betty Gabriel) and Serena (Rebecca Rittenhouse) who are dealing with not only a cancerous mother, but the difficulty of parents accepting their sexuality, conspiracy theorist AJ (Connor Del Rio) who has his own Youtube channel where he can scream into the void for his theories, Damon (Andrew Lees) is the resident computer expert Matias pulls up side chats with when he needs to figure out how to solve one of their technical problems and he also serves as the guy who explains technical jargon for the audience, and Lexx (Savira Windyani). All seems to be well until Matias starts exploring hidden folders on his newfound computer and discovers that the owner “Charon IV” (Douglas Tait) is into some dark stuff…. Dark like stalking, kidnapping, and killing young women. Oh, and Charon IV knows his computer’s been stolen and wants it back. After a slow buildup, the film kicks it into high gear where the group of friends discover just how screwed they are. At first, it’s only Charon IV to deal with, but after a few bone-headed heroic moves, they have members of Charon IV’s Dark Web group also working to cyberstalk and kill them through some genius ways. He’s not called Charon IV for no reason as there are countless other Charons lurking on the Internet and they also want some vengeance for the missing laptop. The film does a great job at building tension. First time director Stephen Susco who has written horror films like The Grudge, The Grudge 2, and Texas Chainsaw 3D, manages to build tension using just the sounds of popups, Facebook notifications, and extremely loud jump scare noises that come out of nowhere throughout the film. He manages to pull some pretty good performances out of the actors and you have to remember, they spend the entire film just staring at a camera and don’t really interact with each other. Unfriended: Dark Web also works because it has absolutely nothing to do with the original and gives it a chance to stand on its own. Perhaps if there is a third film, it will also be a completely different story and this series can operate as an anthology. However, you REALLY have to take your suspension of disbelief pills when you see this movie. Some things like a dark web operative having such an easily crackable laptop, Facebook notifications popping up repeatedly after logging off multiple times, people just taking strolls on rooftops, the bad hackers being “blurred out” whenever they appear on the screen (and the things they do defy current technology), and countless other eye-rolling things happen during this film which hurt it overall. You can say, “sure, this is a thriller/horror film, it has to have some level of campiness,” but there are scenes in this film which max out your patience while watching it. That said, the film is entertaining as the suspense racks up. Depending on your technical sophistication, this film either works well and is very entertaining, or you will get aggressively angry at the technical fallacies presented during the film. Fun fact: there will be two different endings for the movie depending on what theater you see it at. As a result, the ending may surprise you…. or it may not.